Friends, the election of Donald J. Trump has been very hard to deal with, as I'm sure it is for many of you, and exciting for some of you, too. I'm doing my best to honor that. In the exhaustion of riding all the emotions and thoughts and fears and hopes during my fasting period, I am not capable of writing a full blog post now, but I will share some of the posting from my Facebook page. Please take it as it is....it's a process. 1. To remember that God loves us all, including me. 2. Our marriage, and how that impacts our children. Darcie and I thought we were prepared for the transition and all that would bring. We were not ready for what has transpired between us, and I fast to bring awareness and hope back to our bond. 3. Our country, and how that impacts our world. Tomorrow is less important to me than how to function as human beings, together, moving forward. I fast to remember to pray for our nation. I also pray that The Table Setters can find our real voice in this divisive time. 4. I fast for my own body. Ever since we started the move, I have been aching, and one of the fasts I performed in the past brought significant healing. Please pray for me, and send me ways I can pray for you. That's how you manage the hunger, to think about others along with the prayers above. Good Morning America. My fasting has brought some clarity: First, I am calling all of us out on complaining that election year advertising is all about mudslinging. Our advertiser and marketing experts say: it's what the public wants. Looking at my Facebook feed, with all the smears of Clinton and all the smears of Trump, it appears we do want negativity. We want to see our opponents as evil. Young kids playing soccer still like the kids on the other team. We all need to wake up to that, before we lose more and more decency and kindness. That being said, I've done my homework, and I've looked at all the negative slanted videos of Trump and Clinton. The vast majority of the anti-Obama, anti-Democrat, anti-Michelle Obama, anti-Clinton videos are either clearly doctored, or when you look further, placed in a very misleading context, and still able to cause distaste for these leaders. The videos on Trump are literally his own words, no doctoring whatsoever. Remember, this is a man who has said negative publicity is still publicity, and we know that he tries to cause a stir. Trump supporters, please stop complaining about him being "smeared:" he lives for this. He asks for the attention. He's like the Lady Gaga in a meat suit of this election, loving the shock value of his Tweets. He is not hurt when the media focuses in on his behaviors, he intends it to happen. This is not meant to be negative, just honest. Look at the videos for yourself, and do further searches to hear the entire videos. If you care. I believe you should care. Compassion and kindness ought to be values of our people. Tomorrow we begin the great work of healing from 2016. I hope you'll join me at the Tables. Voting complete. 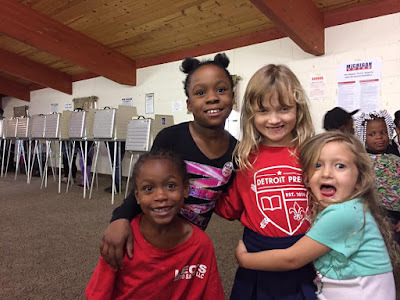 It was a blessing to vote alongside our mostly African-American community; knowing that voting has not always felt like a right in this community; knowing that throughout distant and recent history, people who look like our neighbors have been threatened, intimidated, assaulted, taxed, mocked, insulted, and killed for trying to get to the polls. Today, I admit I got emotional to stand strong together. 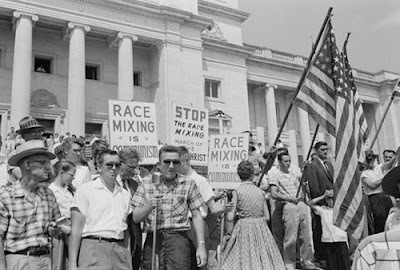 Martin Luther King, Jr. made concrete connections between the discrimination of white working class Americans and African-Americans right before his life ended. It is tragic how both major political parties have ignored this for the past decades, Clinton included. And Trump certainly appealed to these hard-working white folks, but he did so by employing clearly racist, xenophobic, and sexist statements regularly. That is scary. Will a Trump presidency deliver to both sides, or either? Or did he use the overlooked white constituency just to win? Will he forget about them right away, too? And what about the majority demographic rapidly changing in our country in the next 8 years? These are only some of the questions I have now, and time will tell. Martin Luther King worked for finding common ground between the divisions. He got killed for it. Trump built up his power by exacerbating divisions, and that is deeply disturbing. Whether you are celebrating or grieving tonight, please don't forget this. How can we set tables with all that we've seen? I pray we find the courage to listen and still fight systemic and personal racism. I pray we consider the irony of a man who has exploited poor workers in our country and other nations now claiming he cares about our many working class folks. I pray we consider what "law and order" actually means, fully conscious, as I've written before, that Clinton has been supportive of building up the prison industrial complex, which has deeply destroyed our communities of color. But then I care more about what we do about it. America: How will we show each other we are not against our many beautifully diverse citizens? And America: how will those of us who have knocked "hicks" and "hillbillies" actually listen to their long term pain as well? Socially, that's the only way forward I see. I'm working this out here because I've got a heavy heart to face my children in the morning. So I will turn to Jesus. And I pray that brings me hope by the morning. He's my hope. 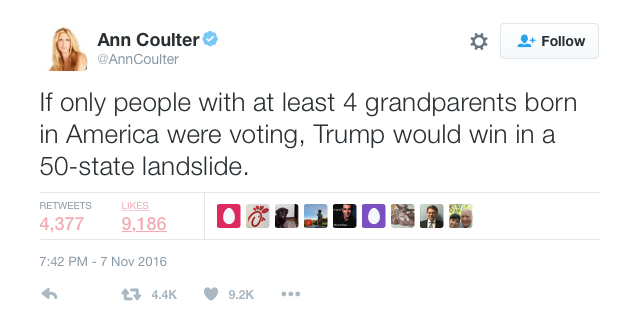 Dear Ann Coulter: If only the children could've voted. "See that you do not despise one of these little ones, for I say to you that their angels in heaven continually see the face of My Father who is in heaven." - Matthew 18:10. Our children are in denial, they can't even talk about it. I pray for the children of our Muslim neighbors in Dearborn. I pray for the children with browner skin than ours living on our street, and on hundreds of thousands of streets in this country. I pray for every child who has ever been bullied for "who they are," that there is not new license to treat kids poorly, savagely, or worse. I pray for the little child in all of us, not just for those of us who are grieving, but also those who are celebrating. How does our inner child feel about all of this? I will do my best to stand strong in hope with kindness, compassion, mercy, and forgiveness: the only strengths that have truly ever changed the world for the better. I just received an encouraging message from a Trump supporter about the spirit of our work at The Table Setters. I will take that as a sign we need to press on. Pressing on. 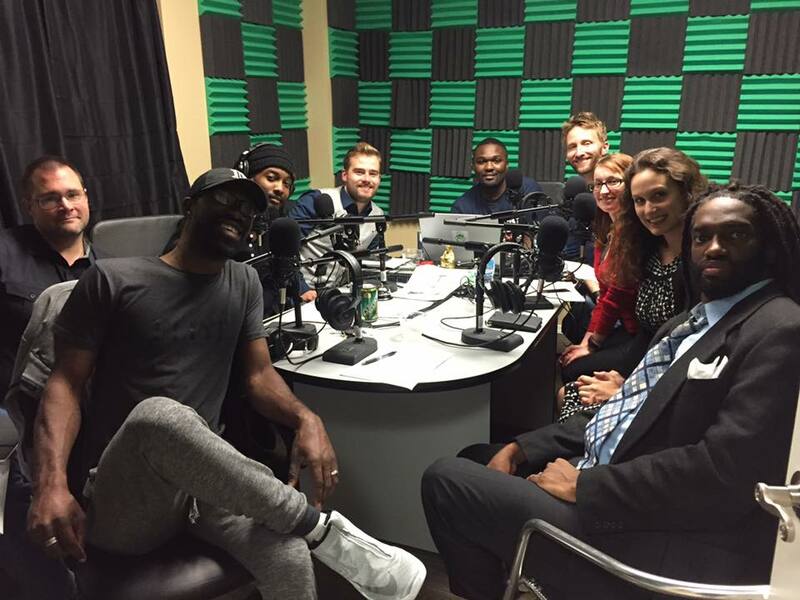 I went in with great exhaustion and trepidation, but I am so grateful to have been a guest on Podcast Detroit around this really diverse post-election table, racially, politically, theologically and personally. I went in tired, I come out ready to step forward and continue this work. Host Calvin Moore wrote this: Had a cathartic and sometimes heated conversation about the election tonight. There was hope, despair, confusion, cognitive dissonance, and a host of other emotions we worked through. But, the one thing I walked away thinking was, "I think we're gonna be okay." Thanks so much to DeAndre A. McDay, Kelly Cleaver, Marissa Fillmore, William Byron Reese, Kenneth Gerard Andejeski, Nathan Liverman, & Matthew John Schmitt for coming out tonight. It meant the world. Hopefully, together, we can move forward to a better America and a better world.